Sit comfortably, Close your eyes and visualise yourself stood on the top step of the podium... The sun warming your face as the crowd all clap and cheer to celebrate your success. You bend down to receive your wreath and trophy feeling the sweat-soaked base layer cooling your back, you feel the relief that finally you have done it... Your first win... You never want the feeling to stop! Given the knowledge and support that MADE Motorsport have, we see no reason why it should stop either! Yes, we are a young team, in the grand scheme of things, but our youthful exuberance is a good thing. We are open to mixing things up a bit to see what works best for our drivers and we aren't afraid of a mistake or two if we learn from it and move on. That being said, we do have the experience of winning in the Junior Saloon Car Championship and we know how to make it happen again. Don't believe us, just check out how Luke Browning did in 2016 with us... 4 trips to the podium and a top ten finish in our first year. And now look at him! 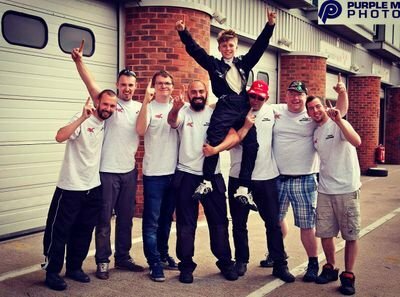 Rubbing shoulders with touring car drivers as he dominates numerous circuits in the Ginetta Juniors. Get in touch and let's talk about how we can get you on that podium for next season... It's going to be amazing! P.S. You don't even have to wait that long if you are currently racing in the JSCC... We are currently looking for drivers to support for the remainder of the 2018 season. This is great news for those of you who want to push for the final few rounds and bag as many of those vital double points at Oulton Park's season finale!! Two podiums for Luke Browning, most importantly, his first win! Newer PostJack Fabby shakedown at Oulton Park... His biggest challenge yet?